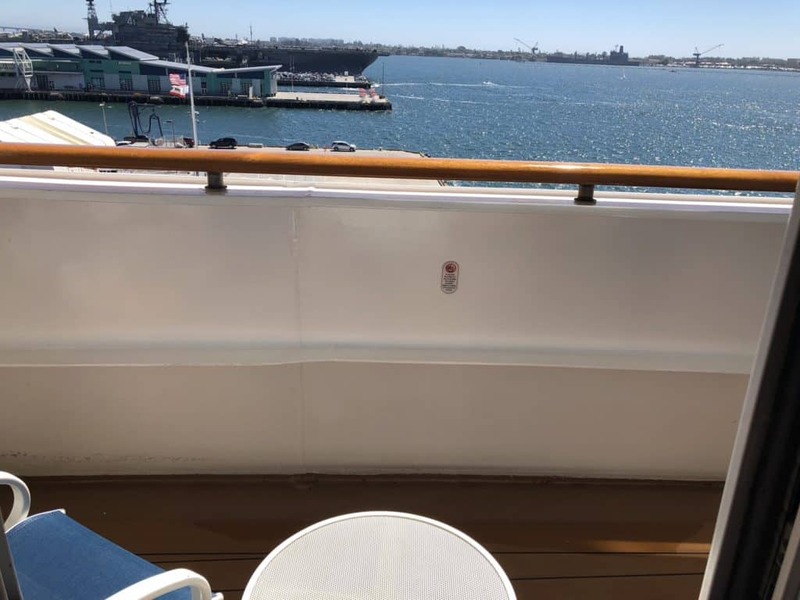 Are you looking for a Disney Wonder Cruise San Diego Trip Review? 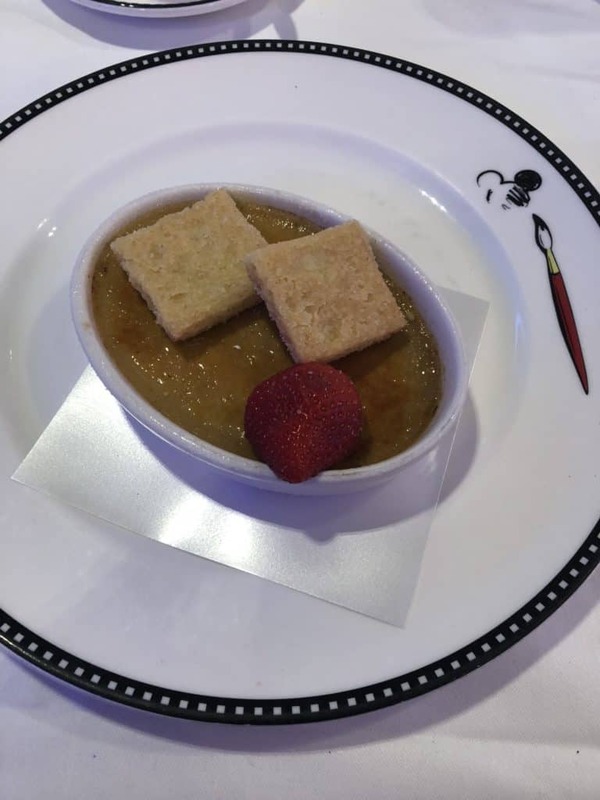 I have just returned from another amazing cruise on the Disney Wonder and I am excited to be writing my very first trip report. 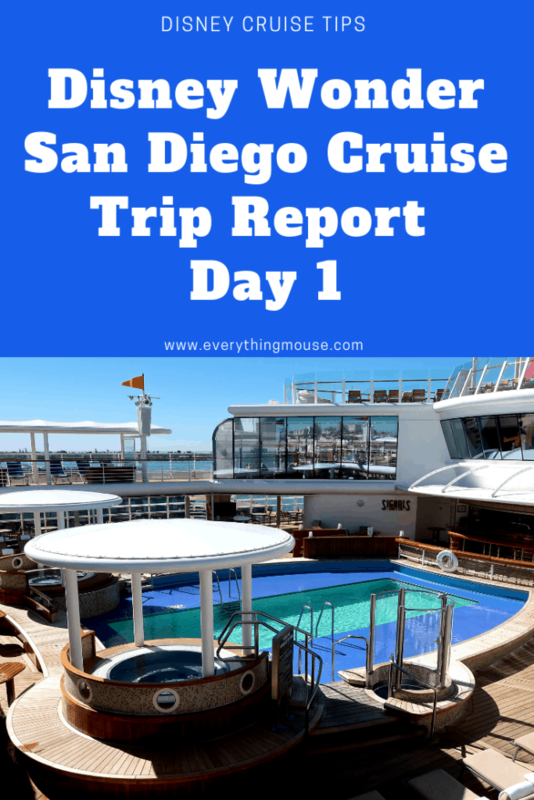 Even though I have sailed many times on Disney cruise lines this is the first trip report. It certainly won’t be the last! The Disney Wonder is probably my favorite of all the Disney cruise ships. Getting to the port was very easy. This was a Disney Wonder San Diego cruise and we live very close to the port. It is an easy drive. As we didn’t want sort out parking we just took an uber from home. It was great to be so close to a Disney cruise! It was the first Disney cruise without the kids. It was going to be interesting to see what a different experience that was. I worked out that this was my tenth week spent sailing on the Disney Wonder! 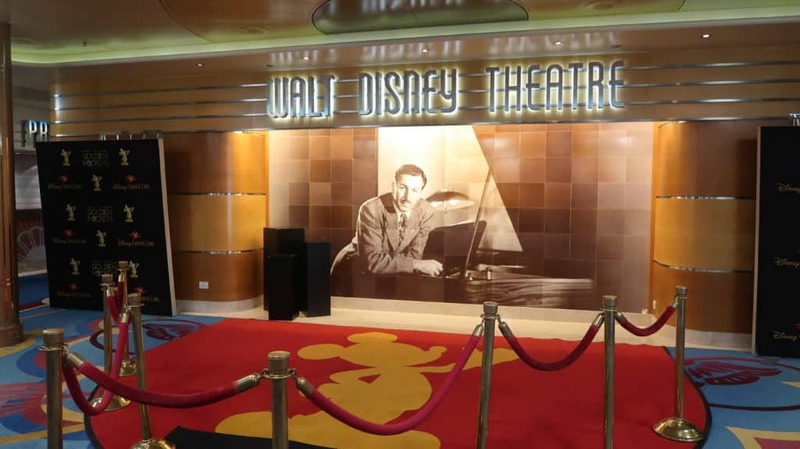 DH was sailing for the second time on Disney and the first time on the Disney Wonder. I was interested to see how he felt about how it compared to the Disney Fantasy. The port of San Diego does seem to have vastly improved the embarkation process for Disney cruise lines. I remember when the Disney Wonder first sailed out of San Diego the port was absolute chaos. Thankfully the process now seems to be really easy. We arrived at around 11.15 am. 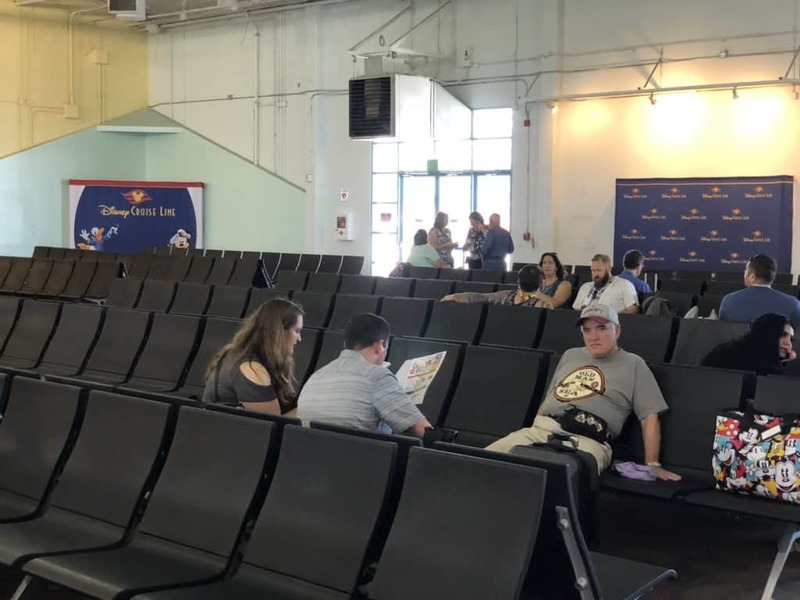 There are 2 waiting areas in the San Diego port. One is before you get to security and the other is after you pass through security. As we had arrived a bit later than we usually do, we could walk straight through security without sitting in the first waiting area. 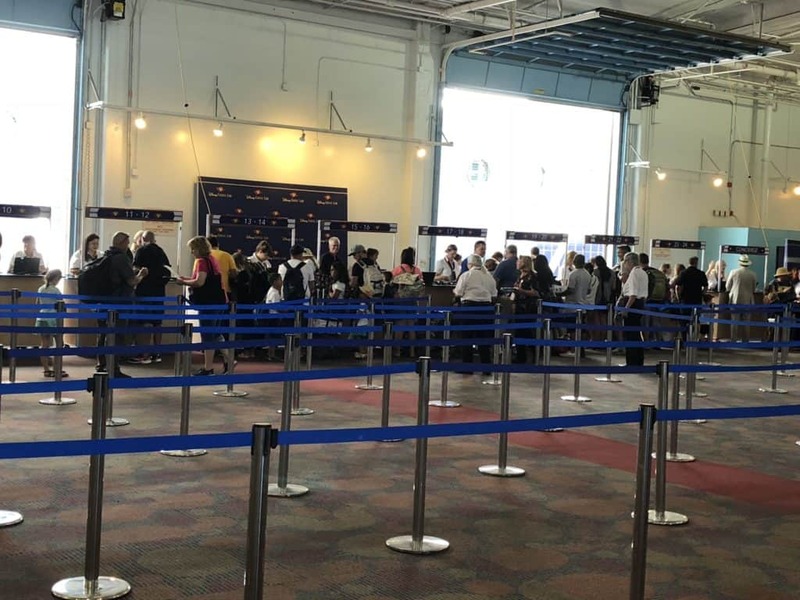 There was barely any wait at security. It’s a very easy process – not like the stress of getting through an airport security line! We were soon being handed our first Navigators and heading towards the check-in. There are 3 lines. One is for guests who haven’t sailed before. The next is for Silver and Gold Castaway Cay members. Then there is the much shorter line for Platinum Castaway Cay and Disney Cruise Concierge guests. We walked straight through the line to check in with no wait. The check in is very easy. They updated the photos and gave us our Key To The World Card. I was really pleased to see the dining rotation that we had. It was AP-TP-TP-TR-AP. What does this mean? AP is Animators Palate. TP is Tiana’s Place. TR is Triton’s. 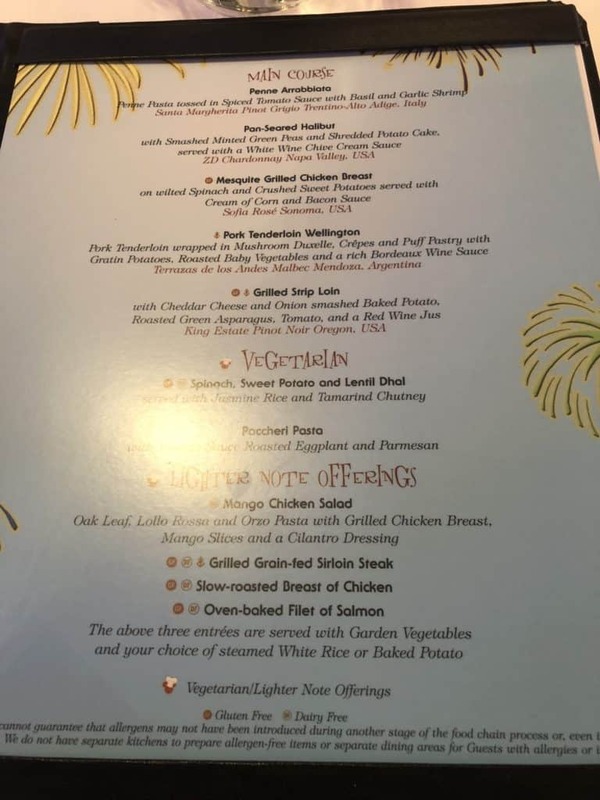 As Triton’s is my least favorite restaurant I was glad that we got this only once. Another good thing was that I knew we had a Palo dinner booked for the third night. This meant we would miss the Pirate Night menu in Tiana’s. I count the Pirate Night menu as one of my least favorites, so was glad to be skipping this. I sat down to study the Navigator and work out what the plan for the first day is. DH sat down and did some last-minute work. 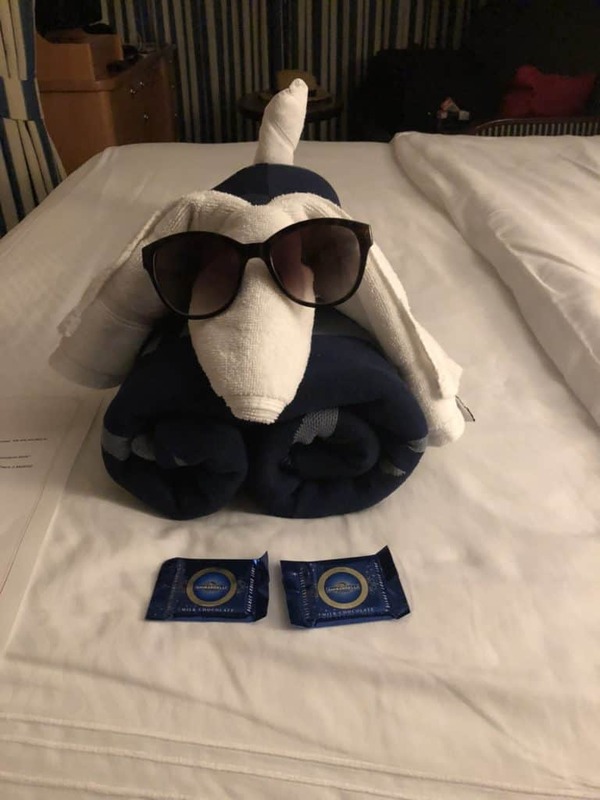 He had promised me that he would not work on the cruise this time! The port of San Diego is smaller than the one at Port Canaveral. However, the room really did not seem crowded at any point. As predicted boarding began at noon. It went really quickly and we were on board by 12.30. We skipped the embarkation photos. I just wanted to get on the ship. I kind of regretted not getting one though as I have always had one before. Getting on the ship is always a very emotional moment. When they announce your name and applaud I always fight back the tears. It felt so good to be back on board the Disney Wonder. The first task was to try and get a reservation for Palo Brunch. I already had one for dinner but hadn’t been able to get a Palo Brunch booking online. They always keep reservation spots back so I knew it would be fine if I asked for a reservation. 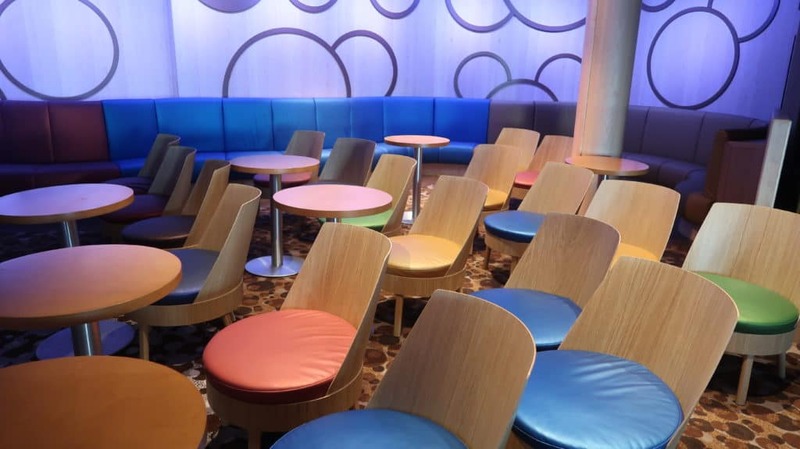 The dining team was in the Promenade Lounge taking reservations for Palo and the various drinks tastings offered. We already had a Mixology booked so didn’t want to book any more tastings. It was easy to get a Palo Brunch reservation for 10 am the next day. I requested my usual server, Judy. I have known her for years and she has always been my server in Palo. I was definitely looking forward to catching up with her. Getting back on the Disney Wonder is always like returning to see old friends. Cliche, but true. The next thing to do was to go and get a Couple’s Pass for the Rainforest Room. This is always a priority for me as DH and I both really enjoy spending time there. I know that the Disney Wonder Rainforest Room isn’t as wonderful as the Fantasy or the Dream, but we still enjoy it. The 5 Day Couples Pass for the Rainforest was $169. 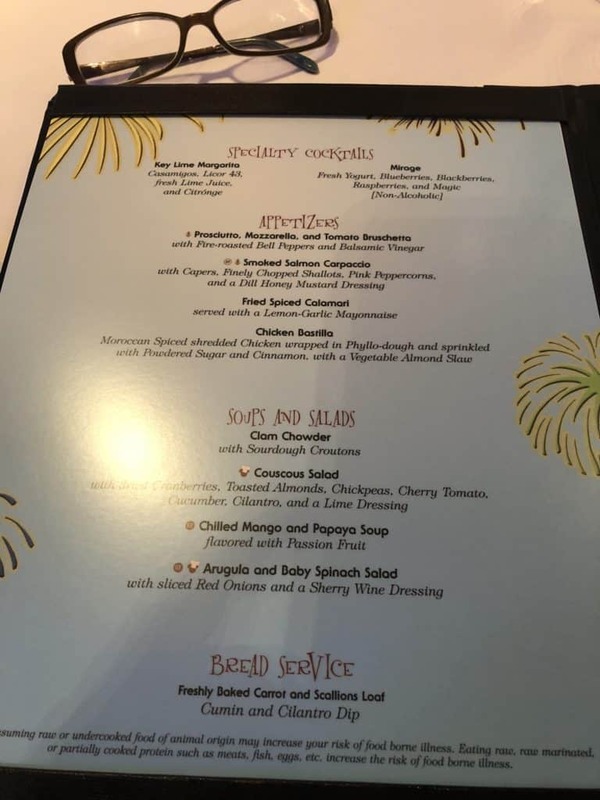 You need to add the 18% automatic gratuity to that which takes it to $199.42. I have no problem paying gratuities to the servers, bar staff and stateroom stewards. 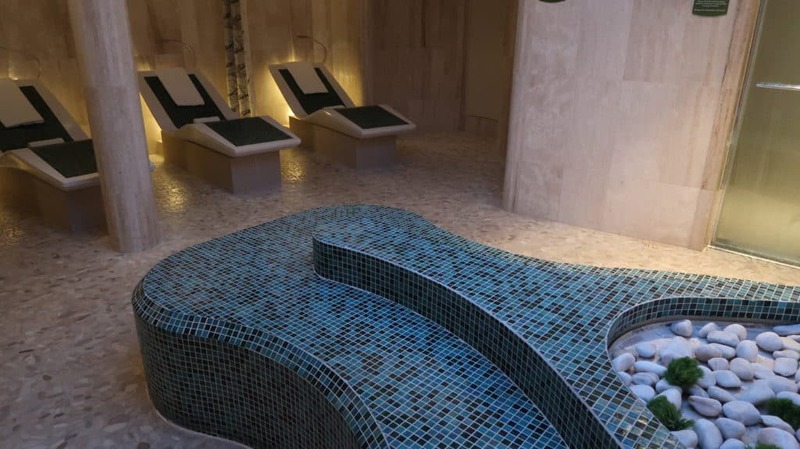 Also if you have a spa service then 18% is fine. However, it really does seem a bit much to add the 18% on to the Rainforest Room. You really don’t receive any service other than them handing you your wrist band every time you visit. Of course, by this time we were hungry. 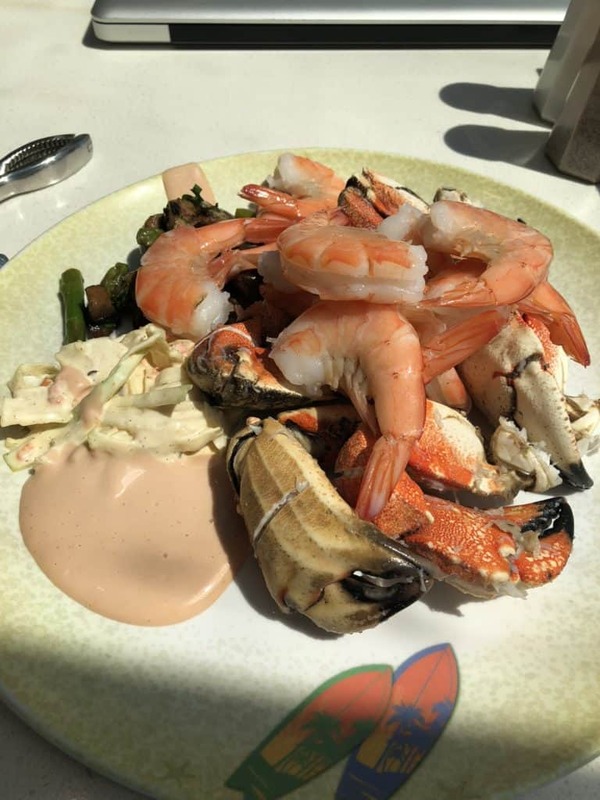 It was around 1 pm by the time we made it to Cabanas buffet. I like the fact that all of the ships now have the hand washing station outside the entrance. So much better than the hand wipes. We arrived at the buffet at the busiest time and it was quite difficult to get a table. The one we did get was right near the window at the side of the ship inside. I could see why it was available as it was right in the sun! It was incredibly warm there but we didn’t stay for too long so it was fine. The new design of Cabanas is so much better than the previous incarnation as Beach Blanket. It used to be very crowded in the buffet line and there weren’t enough seats. Now they have widened it so you can skip in and out of the line more easily to get what you want. 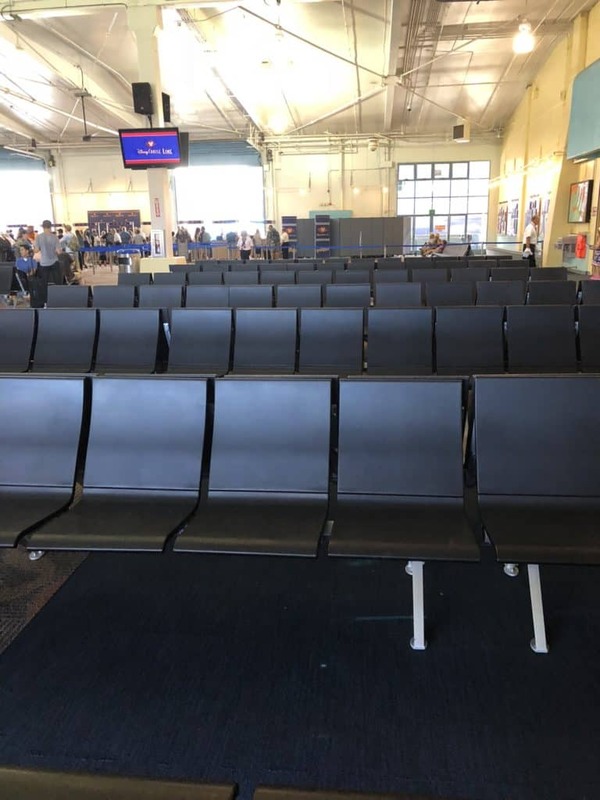 There is also a lot more seating. I knew exactly where I was heading. To the shrimp and crab claw section! This is my favorite part of the buffet and I can always justify it to myself by saying it isn’t too high calorie. With 5 days on a cruise ship ahead of us I wanted to start reasonably healthily as I know what a challenge it is to keep that up! By the time we had finished, it was 1.30 so time to go to the stateroom. 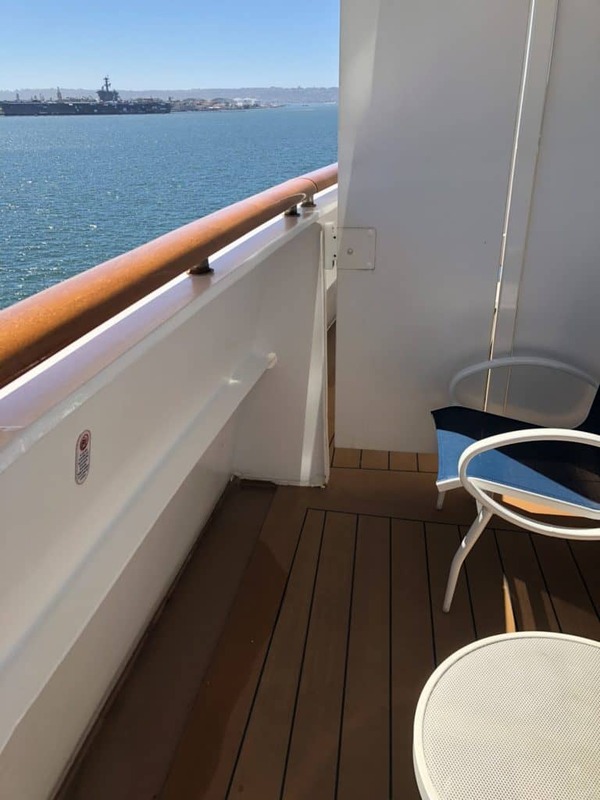 We had an aft balcony stateroom so I knew that the quickest way to get there was by the “secret” stairs that go from Cabanas to the staterooms. I had chosen stateroom 6646 which is a Category 6A stateroom with verandah. 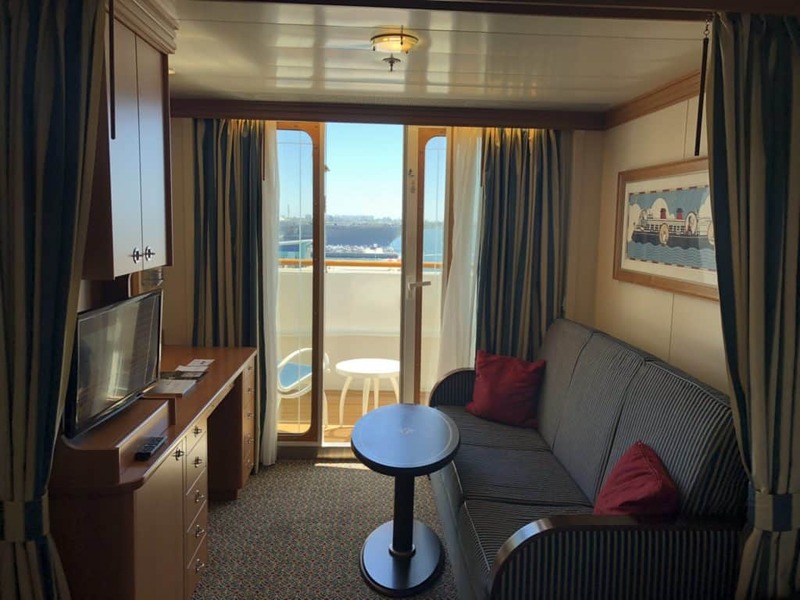 It is almost at the back of the ship and has a white wall verandah. Most of the verandahs on the Disney Wonder have a clear wall. The 6A category has a solid white wall. What this means is that if you are sitting on your balcony you cannot see towards the ocean. I had debated a lot over whether or not to go for the white wall verandah. It was about 15 percent cheaper than the next category up with a clear wall. As soon as I saw the balcony I was glad that I had chosen to save the money and go for the white wall. It really wasn’t worth the extra money for me to upgrade. We spent a lot of time on the balcony and not once did I wish I had upgraded. The stateroom was exactly as I expected it. I have sailed many times on the Disney Wonder in all categories of stateroom. All of them are well appointed with plenty of storage space. I pack pretty light and didn’t even use most of the drawers. 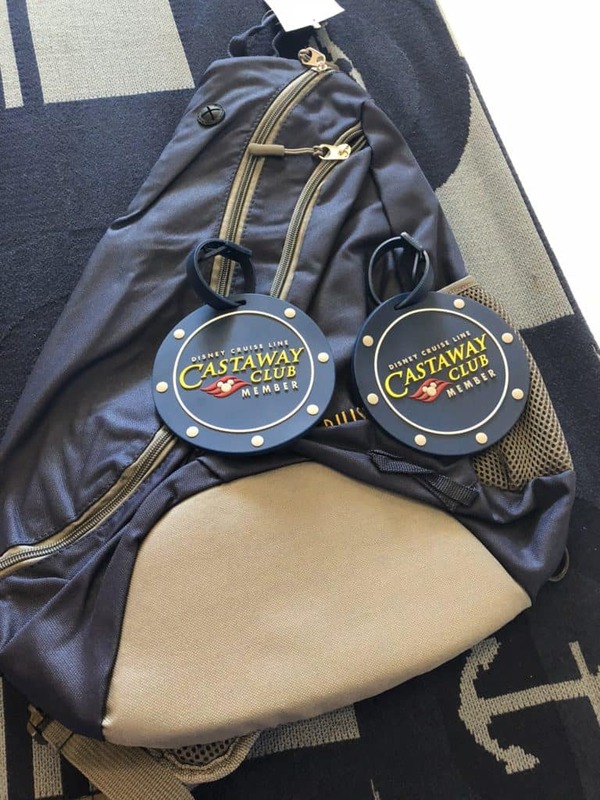 We got the usual Castaway Cay gift of the backpack and luggage labels. I am not sure how many I have of these now, but I do prefer them to the yellow canvas bags they were giving out a while ago. We often take the backpacks to the Disney parks with us.
. It just makes things so much easier. I always pack the swimwear in the carry on so that we can go straight to the pool. As we didn’t have the kids with us we headed straight to Quiet Cove Adult Pool. There weren’t many people there so it was easy to get a sun lounger. We went in the Quiet Cove Pool and had it completely to ourselves. Luxury. It was a perfect temperature and we spent a long time in there just relaxing and enjoying being on the ship. We went back to the stateroom at about 3.45 as I knew we had to go to the Guest Assembly Drill. 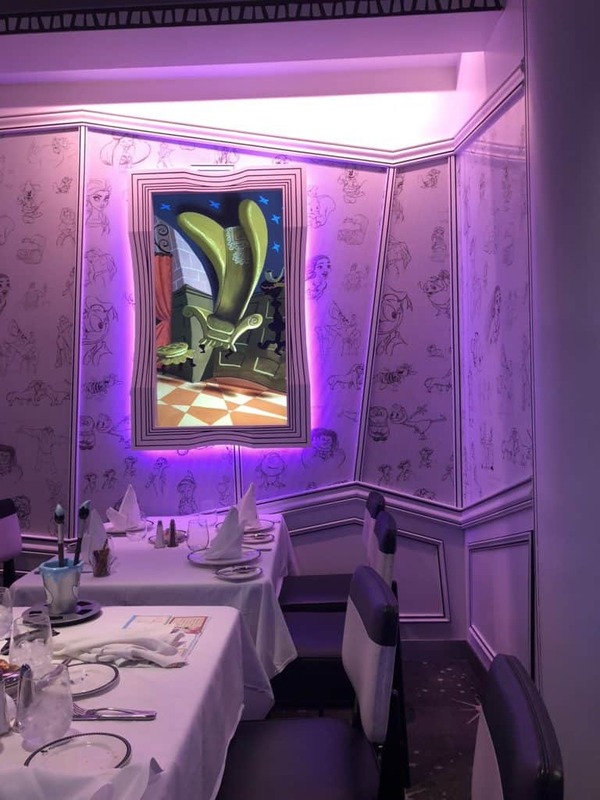 We were fortunate and had the drill in Animator’s Palate restaurant. It’s always nicer to sit down, rather than have to stand on a crowded deck in the sun! Also, it is great now that you do not have to take your life jacket to the drill. It was a simple walk down the back stairs (which are not normally accessible from Deck 6 to 4) to get to Animators Palate. I have been to many drills on Disney ships and others. To be honest this one didn’t seem the best organized – even compared to the last one I attended in Animator’s Palate. They have a number of different muster groups in the restaurant and you all had to go to your own area. No one seemed to explain that you needed to stand in line and give your Key to the World to the Cast Member. Fortunately, I have done this many times before, but I think if I hadn’t it would have been confusing. There were general announcements over loud-speaker, but individual ones were done by each group team leader. This meant that you heard the same thing a number of times. I am not sure why they had the individual Cast Members giving the instructions as it was just more confusing. The drill was over quickly and we decided that we wanted to get the most out of the Rainforest Pass. So we headed, therefore, a quick visit before sail away at 5pm. There really wasn’t that much time, but half an hour in the Rainforest is better than nothing! We were the only people there so it was very quiet and relaxing! We headed back to the stateroom just in time for sail away at 5 pm. Sometimes I want to go to the Adventures Away Party on Deck 9. This time we felt like being away from the crowds so decided to stay on the balcony. We had brought a bottle of sparkling wine to open for the sail away. Disney cruise alcohol policy lets you bring up to two bottles of wine each on board. This is so much more generous than most cruise lines which don’t allow you to bring anything at all. 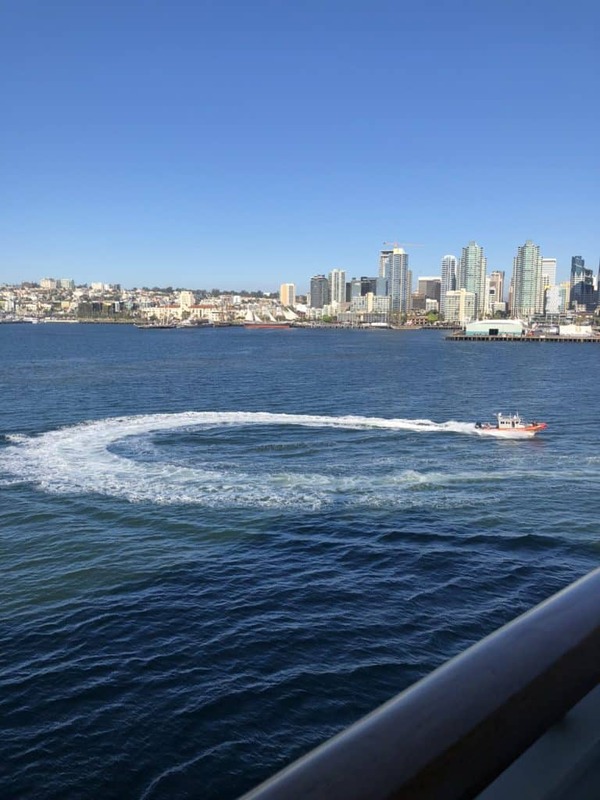 The sail away from San Diego is always a lot of fun. As we live here it is interesting to see all the landmarks from a different point of view. 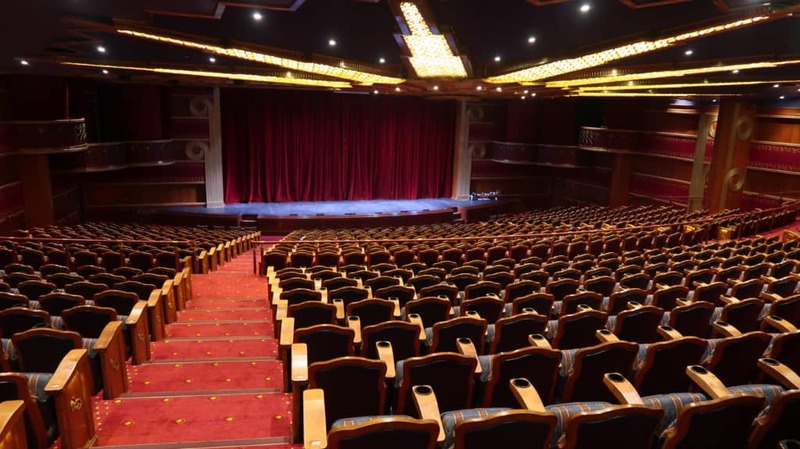 After sail away, I knew that I wanted to get to the Walt Disney Theatre as soon as possible to get a great seat. The show is one of my all-time favorites, The Golden Mickeys. It’s such a great way to start the cruise. The theatre was not particularly full and we managed to get a great seat in the middle about seven rows back. We didn’t have to wait long before Cruise Director Natalie introduced the show. She has been the Cruise Director for my last three Disney cruises and is one of my favorites. The Pre Show for Golden Mickeys is always fun. They have the presenter outside the Walt Disney Theatre to “interview” guests on the red carpet. The whole thing is set up like an awards show. The Golden Mickeys really is one of the best shows on a Disney Cruise (it is also on the Disney Fantasy). The theme is that a backstage hand mistakenly has to present the show. She doesn’t have the courage to think that she is good enough. However, she gets some help along the way from none other than Disney CEO Bob Iger. The show is wonderfully cheesy in parts but has a great variety of songs and performances. Standouts are The Hunchback of Notre Dame, Cruella de Ville, Princess and the Frog and Tangled. At one point I thought Cruella was going to take a fall as she got out of the car, but her fellow cast member caught her and she didn’t skip a beat. A favorite part of the show is the appearance of Tarzan. This is not a man who spends any time in the buffet! The Mulan sequence is also really impressive. One of my all-time favorite parts though is the Lion King sequence. The singers were amazing. The Golden Mickeys is always a great start to the cruise. Now it was time to enjoy another one of my favorite Disney cruise activities. Trivia! It was a short walk down the stairs to Deck 3 to Azure. There was quite a crowd gathered. When I have the boys with me we have a good chance of winning. Almost a decade of Disney cruises combined with the boys being brought up in a very Disney orientated household means we often do well. However, on my own, I generally have no chance! It was a lot of fun even though I was way off the winning score. Someone got full marks with all the questions right. 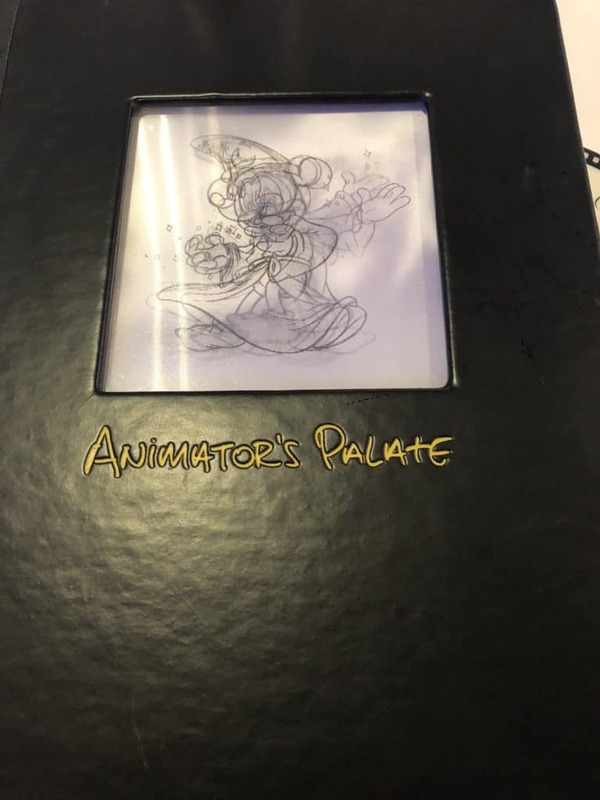 I was very excited to dine in Animators Palate. It has been updated since the 2016 Disney Wonder dry dock. I was a little confused when I walked in as the servers all had on such dull outfits. They were white shirts with green aprons. Just not up to the usual standard of interesting design for the servers on the Disney ships. It just seemed so ordinary. This wasn’t the only disappointment, unfortunately. I was expecting the Animation Magic show. 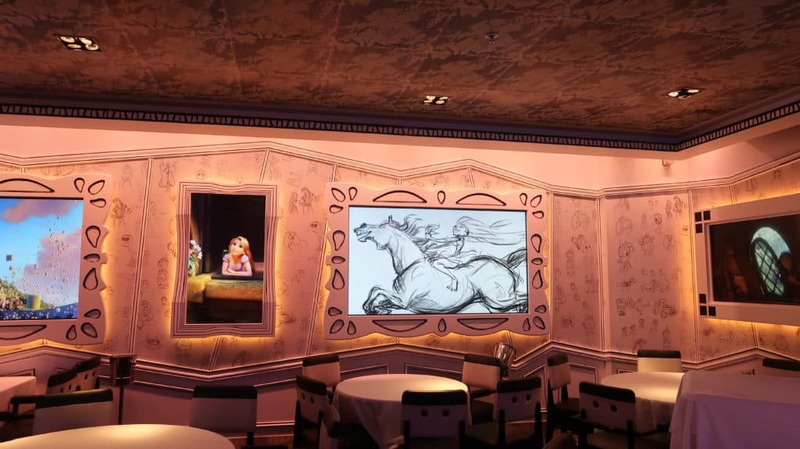 This is where guests draw a character which is then animated and displayed on the walls around the room. However, this didn’t happen. I am not sure why as the last time we sailed on the Disney Wonder we did have the Animation magic show. Anyway, it was disappointing, but the experience was still great. Animator’s Palate is a beautiful restaurant. 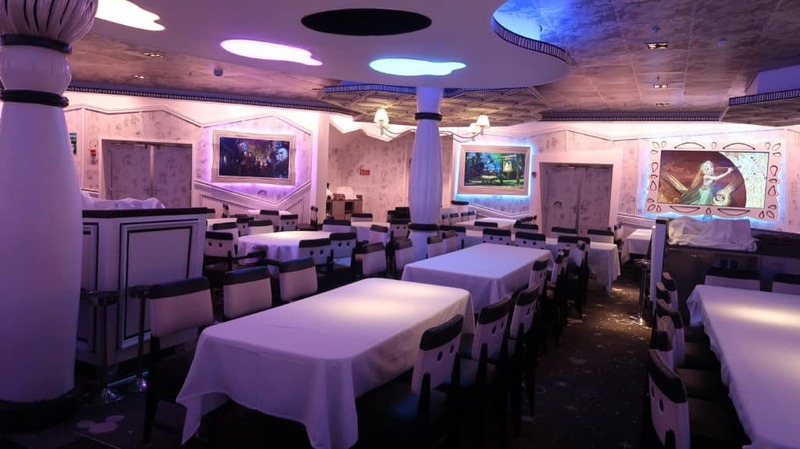 The black and white pictures on the walls change to color throughout the meal. Everything is beautifully done. Even down to the ceramic paint pot which shows your table number. We had requested the server who we had last time on the Disney Wonder. I admit that initially, I was a bit disappointed when I didn’t see him. Our new server Netasha came to our table and introduced herself. She explained that Norbert had just gone home for a while. I didn’t stay disappointed for very long! Netasha was wonderful. Truly exceptional. She really wanted us to be happy with all our food and the service. Her assistant Luis from Peru was also very good. It really makes such a difference to have a great serving team. Netasha was one of the best ever! We decided to purchase a Disney Cruise Wine Package. I have sometimes bought the wine package, but after our experience this time I am not sure I would again. We decided that we would splurge and get the Premium Package which is $149 for 3 nights. This gives you 3 bottles of wine from the upgraded choices on the Disney Wine Package List. 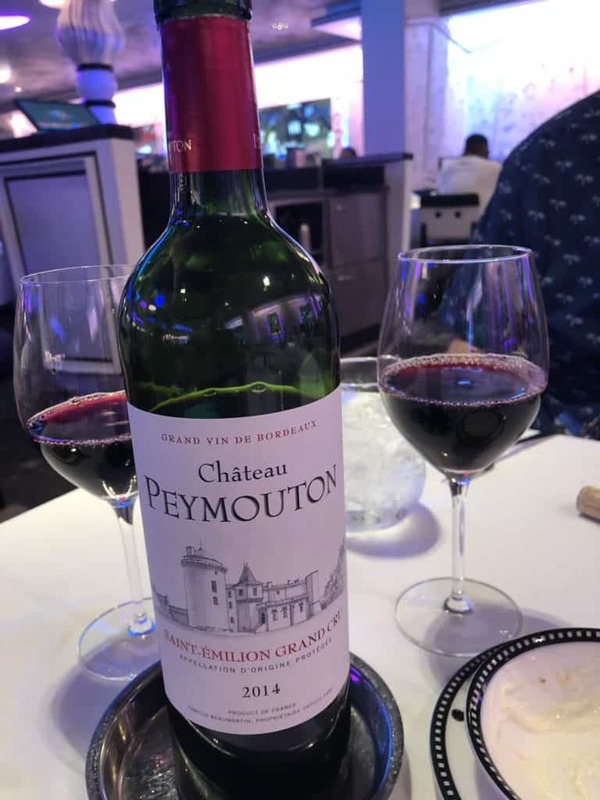 As a first choice, we had the Chateau Peymouton Saint-Emillion Grand Cru. It was fine but really nothing special. It turned out that we had this on nights one and two and still had some left over on night three. Not the sign of great wine! I really didn’t feel that the price we paid, $50 plus the 15% automatic gratuity was worth it. We hoped that the other two bottles would be a lot better! 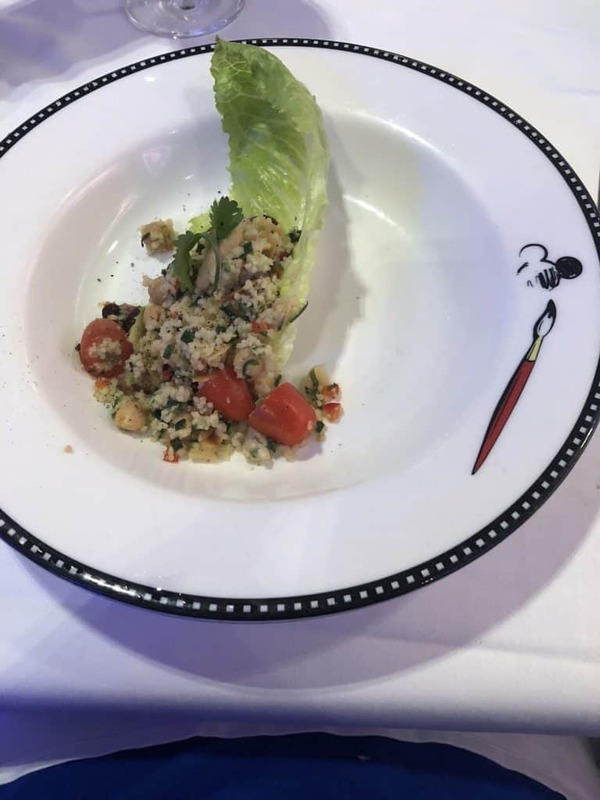 The Disney Wonder Animators Palate menu is one of my favorites. 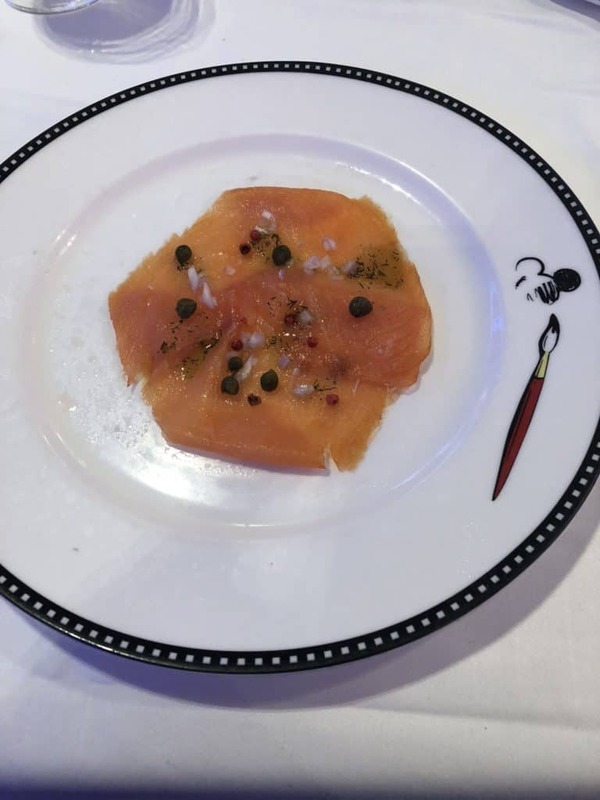 I chose the Smoked Salmon Carpaccio Appetizer. This was truly a standout. Just really tasty salmon and I love capers. It was a great start to the Animator’s Palate dinner. 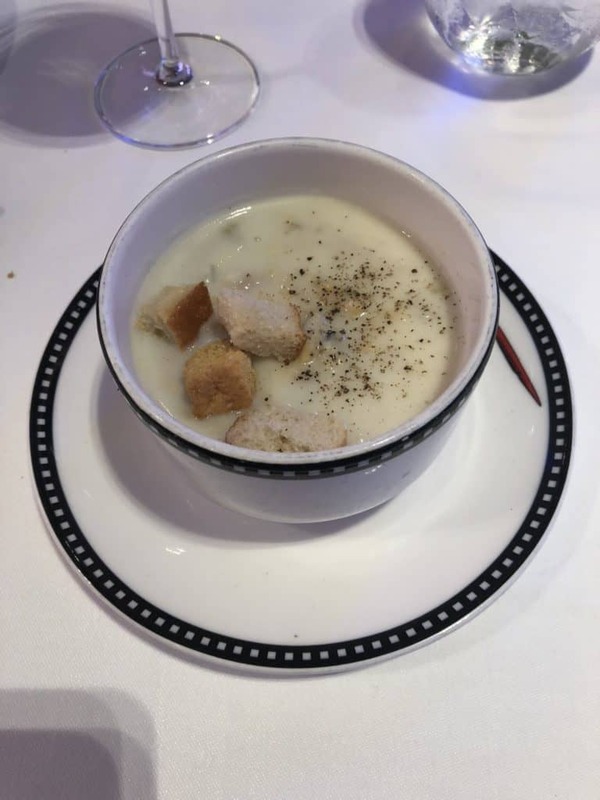 DH had the Clam Chowder and really enjoyed it. I also had the Couscous Salad which I thought was incredibly tasty. The combination of Cranberries, Almonds and garbanzo Beans was really good. For the main course I chose the Pan-Seared Halibut. Again it was a real favorite of mine. The Smashed Minted Green Peas were excellent – reminded me of English mushy peas! 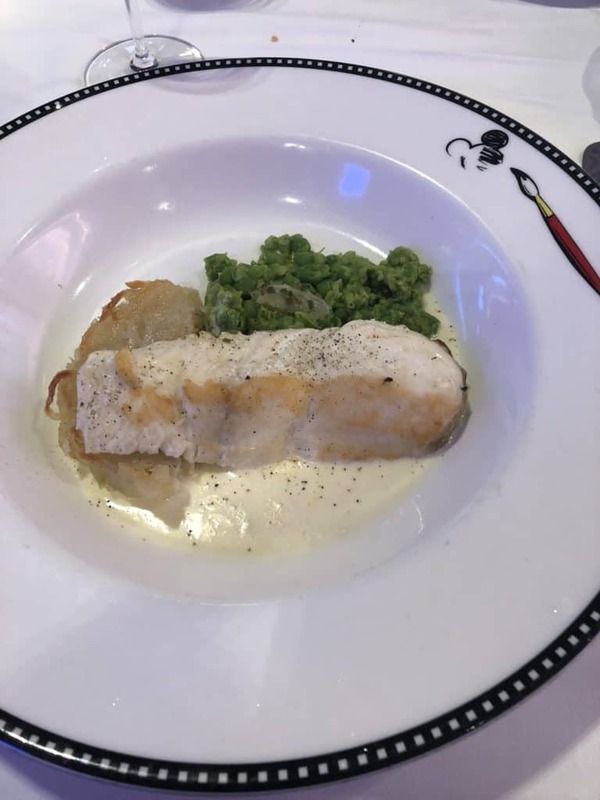 The halibut was perfectly cooked, but I would have liked a little more of the White Wine Chive Sauce. Although having said that I am sure the calorie count today was pretty high already! DH had the Pork Tenderloin Wellington and said that it was really good. Now for the Let The Magic Begin dessert menu. We both chose the Kahlua Creme Brulee. It was pretty average for a creme brulee. I am not sure that I liked the Kahlua flavor. The Cinnamon Shortbread Cookies were not great. I feared I may break a tooth as they were so hard! The Animators Palate rotational dining was a great way to start the cruise. The food was really good, apart from the desert, and I was so full I didn’t really mind about that. The food service was very efficient. Not rushed but just at the right pace. We were finished at 9.30. Sometimes the first day takes a while longer than that so I was surprised when I saw the time. We took the chance to have a walk around the Promenade Deck 4. I really enjoy walking around Deck 4. It is one-third of a mile each circuit. This time we rarely saw anyone else walking – probably because we mostly did this in the evening. It’s a nice way to pretend that you are walking off some of the calories from dinner. We had planned to go to the Cadillac Lounge, but we were both really tired. So we decided to go back to the stateroom. When we got back to the stateroom we found the note that we had to move the clocks forward by an hour. The stateroom steward had already changed the alarm clock time for us. I then tried and failed to work out how to change the time on my iPhone. It changes automatically of course, but it was on airplane mode so wasn’t connected. Anyway, at this point, I didn’t mind what time it was! We had enjoyed a fabulous first day on our Disney Wonder cruise and were looking forward to the next one!